Hi friends! I wanted to quickly share a few ways we live, enjoy, and absolutely love our small kitchen! I received quite a few emails with the same questions in regards to our kitchen, and I also receive the same questions when we have guests. 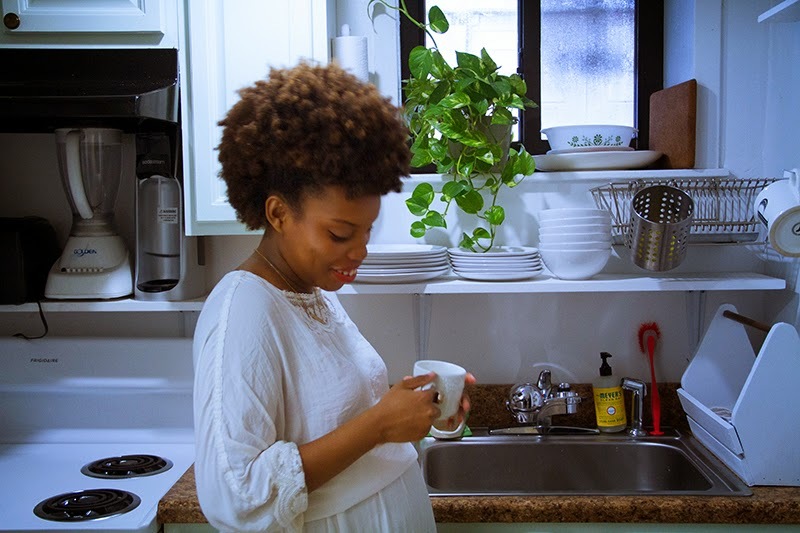 How do you cook with your husband in your small space? Peter and I have definitely grown our relationship around sharing meal ideas, planning, and cooking together as a couple. It has always been a huge part of our relationship, especially since we met while he was working in a pizza place. Many of our old dates consisted of adapting his mother’s recipes and creating them together. With this small space it’s impossible for both of us to physically be in the kitchen together at the same time without annoying each other. 😉 To help with this, we put a stool near our fridge in the hallway that can easily be pulled right up to the kitchen. If he’s cooking, I’ll sit on the chair and talk to him throughout the time. Our chair/cooking ritual is actually one of our favorite things to do as a couple together. How do you deal with dirty dishes and your small kitchen? This is actually the question I love the most. Having a small kitchen makes you keep a clean and tidy space. There’s no room for dirty dishes, so it forced Peter and I to come up with a cleaning schedule that works for our everyday schedule. Our easy schedule is perfect as two working individuals with a child, and it keeps work extremely minimal with a constantly clean kitchen. Where do you store all of your pots and pans? This is where I heavily plug in Ikea. Ikea has rails that are super inexpensive, functional, and easy. We have three of them in the kitchen that we use along with “S” hooks to hang our large pots and pans. -Declutter and keep it out. I live by this rule when it comes to my kitchen. We decluttered before moving in and we’ve kept it that way ever since. If you can’t think of the exact space the item will go and how you will use it, chances are you don’t need it. – Keep simple dishware. As much as I love color, my kitchen along with my bedroom are rooms of simplicity. Especially when it comes to the dishes. White and glass dishes help the space feel open and clean. -Add subtle pops of color when you want (need) to if it’s hard to stray away from color in your small kitchen. We did this with our misty green cabinets, a few of our hanging utensils, and of course with our Meyer’s soap and hand towels. The little details go a long way. -Always try and stay organized. Whenever you see your tiny cabinets and fridge getting a bit crazy just give it a good trip to organizing land. With a small kitchen organizing only takes a few minutes. Anytime I see the cleaning products practically falling out of the cabinet then I know it’s about that time. -Enjoy your small kitchen as you would a large kitchen. In our previous apartment, my kitchen was a space of just thinking and relaxing when I wasn’t cooking. When we moved in this place I found that the kitchen was something I just went in and out of, which I did not like. Now, I take the time to sit on the stool and enjoy my morning coffee. Your kitchen is amazing. I don't know how I just found for blog, but man, am I glad I did. Your kitchen is gorgeous and I'm so inspired for a big de-clutter!